WM2 Series water meters use the widely accepted multi-jet principle, as a gear train drives the register totalizer dials. For pulse output meters, a reed switch sensor is attached to the outside of the lens and detects a magnet arm that has replaced one of the dial pointers. 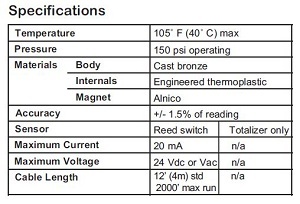 The reed switch output is a dry contact closure and does not require power. These meters are frequently used for residential water measuring as Sewer Deduct Meters or Summer Meters to monitor water that is used outdoors and never passes through to the sewer system. Many municipalities will allow home owners to deduct their outdoor water use from their sewer bill. The WM2 does NOT meet the new federal Lead Free standards for drinking water. It is an ideal meter for HVAC companies to measure the make up water in the cooling tower, irrigation or anywhere that does not require potable water measurement. NOTE: We reserve the right to substitute this product with an upgraded product of WM-NLC when necessary, at the same cost. If you prefer not to receive the upgraded product (at the same cost), please make that clear in the order notes. Not legal to use for drinking water. Does not meet lead free standards. 1/2", 3/4', 1", 1 1/2", 2"